Fourteen football hooligans have been jailed for violence which marred a derby match. The 14 men, aged between 22 and 39, were jailed at Luton Crown Court for between seven and 15 months for their part in the trouble before the Worthington Cup match between Watford and Luton Town last year. They had all pleaded guilty to violent public disorder. 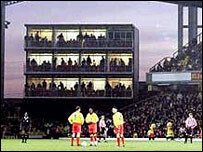 The jury heard rival supporters fought running battles on the pitch at Vicarage Road on 9 September 2002. James Viola, 23, from Luton, nine months. The violence erupted 10 minutes before the start of the first-round tie, and delayed the kick-off for 15 minutes. Police eventually restored order by forcing the pitch invaders back into their seats and blocking off the area behind both goals. Judge Seddon Cripps sentenced 10 Luton Town fans and four Watford fans. Judge Cripps will impose football ground banning orders for all 14, at Luton Crown Court on Thursday. Speaking after the hearing, Detective Superintendent Steve Read said: "I feel that the judicial system has sent out the right message to those who allow themselves to be involved in football violence. "A lot of these people just allowed themselves to be caught up with the mob and found themselves in a violent and frightening situation. "They all attended a football match and got involved in something. "None of these people were teenagers and none of them had the excuse of poor social conditions. "All have acknowledged that they did wrong. Now they have paid the price."